The Duke and Duchess of Sussex have only officially started their tour of Australia this morning, but the media coverage has already reached fever pitch. Kensington Palace’s announcement yesterday, coinciding with Harry and Meghan’s arrival in Sydney, that the couple were expecting a baby, has dominated front pages in Australia today. 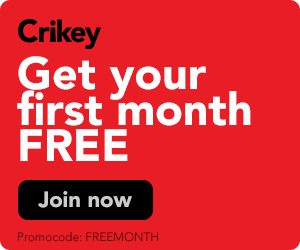 Some of the News Corp papers, most prominently the Daily Telegraph, have published paparazzi shots taken of the couple on their rest day on Monday at Admiralty House in Sydney. Our headline of the day goes to an unusually creative Sydney Morning Herald, with “A smooth ride to Sydney, but royals reveals a bump on the way”. 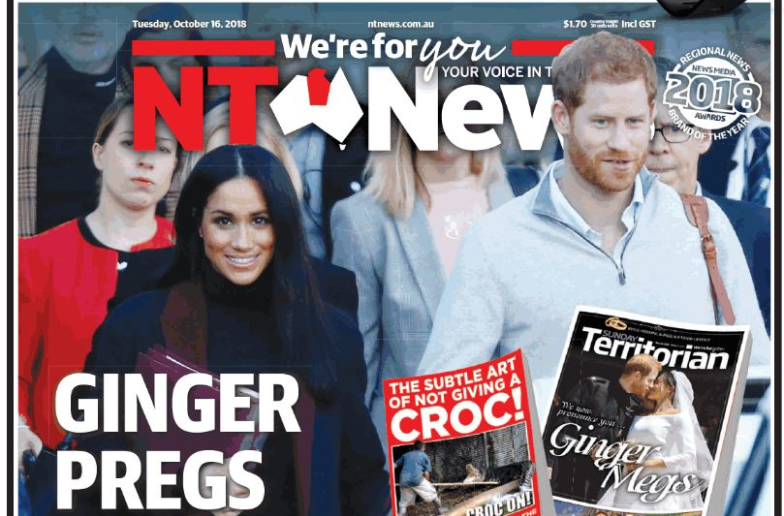 The NT News, again repeating one of its popular headlines, updated its royal wedding headline, going for “Ginger Pregs” (after the couple’s wedding, the front page headline read, “Ginger Megs”). 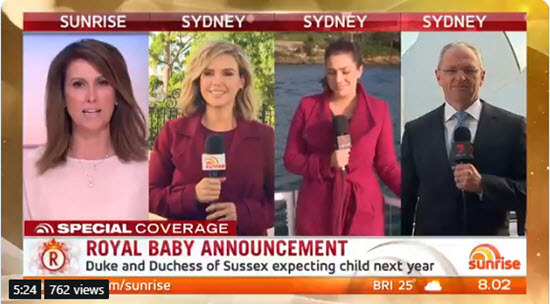 Over on Nine, newsreader Sylvia Jeffreys was dispatched to report in from Admiralty House, and on ABC’s News Breakfast, Michael Rowland was smugly remembering his prediction yesterday (before the announcement) that Meghan was pregnant. 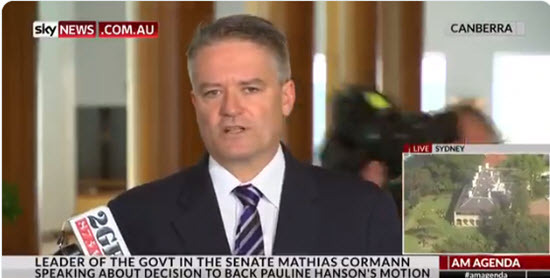 And Australia’s dedicated news channels have not neglected the story on the first morning of the tour. 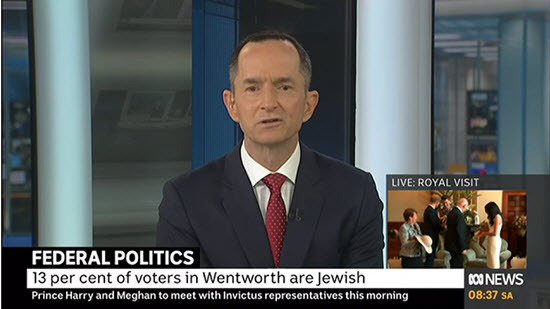 ABC News 24 was checking in to live footage of the couple’s activities throughout the morning, including live vision of Admiralty House during other stories. Sky News also kept live vision of the royals and their whereabouts up on screen while covering other news. And they’re only just getting started. The tour will run for 16 days in Australia, Fiji, Tonga and New Zealand. When Harry’s brother William and his family toured Australia in 2014, media monitoring service iSentia recorded 30,000 separate television news segments, and the daily metro newspapers dedicated 25 front pages to the visit over 10 days. The circus is in town – and the media are the clowns. Phil the Greek must be rolling in his grave – (I know he’s not officially dead yet) The ‘royal family’ now includes the blood of a descendant of a slave that Britain probably shipped over to the land of the free, and a blow in ‘bluey’. This country ain’t big enough for the 3 of us. I best be gone. 16 days you say!